Romanian investigators have found the remains of paint, canvas and nails in the oven of a woman whose son is charged with stealing masterpieces from a Dutch gallery in October last year. 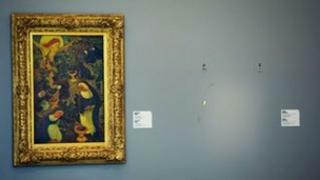 Paintings by Picasso, Monet and Matisse were among the artwork stolen from Rotterdam's Kunsthal museum. Olga Dogaru admitted last week to torching the artwork to "destroy evidence" after her son's arrest. The art is valued at between 100m and 200m euros ($130m- $260m, £86m-£172m). The missing works include Monet's Waterloo Bridge, Picasso's Harlequin Head, Matisse's Reading Girl in White and Yellow and Lucien Freud's Woman with Eyes Closed. Forensic specialists found "small fragments of painting primer, the remains of canvas and paint", as well as some copper and steel nails that pre-dated the 20th Century in Mrs Dogaru's oven, the director of Romania's National History Museum told the Associated Press news agency. However, Ernest Oberlander-Tarnoveanu refused to say definitively whether or not the burnt remains were from the seven stolen paintings. He said that if this were proved to be the case, it would be "a crime against humanity". Mrs Dogaru reportedly claimed last week to have hidden the artwork in an abandoned house, as well as in a cemetery in the village of Caracliu. She said she dug them up and incinerated them after police began searching her village. "I placed the suitcase containing the paintings in the stove. I put in some logs, slippers and rubber shoes and waited until they had completely burned," the Romanian Mediafax news agency reported her as saying. Six Romanians have been charged with involvement in what was the biggest art theft in the Netherlands since 20 works disappeared from Amsterdam's Van Gogh museum in 1991. They go on trial next month. Forensic specialists have been analysing the ashes since March and are expected to submit their findings to prosecutors next week, Mr Oberlander-Tarnoveanu said.